There is a great story in today's NY Times on how Sweden dealt with their banking mess. Sweden placed its banks with troubled assets into a so-called bad bank, where they could be held and then sold over time when market and economic conditions improved. In the meantime, it used taxpayer money to provide enough capital to allow banks to resume normal lending. In the process, Sweden wiped out existing shareholders. To be sure, the United States has a much larger economy than Sweden’s, with a vast and international banking system. The toxic assets Sweden took from its banks improved when the economy improved, but Sweden wasnot confronted with a global recession. Still, many analysts believe that Stockholm has lessons for Washington. In effect, the Swedish state took on all the assets that were worthless or impossible to value at the time, and then managed them or sold them with the aim of getting as good a deal as possible for the taxpayer. I've come out against nationalization, but that doesn't mean I don't find the above reading very interesting. The bank swung to a Q4 loss of $1.08 a share, missing views by $1.15. Revenue rose 9% to $1.93 bil. SunTrust Banks (STI) also cut its quarterly dividend to 10 cents a share from 54 cents. SunTrust's provision for loan losses more than doubled to $962.5 mil. The bank said increased unemployment and continued declines in home values drove delinquencies higher. It fell to 13.55. • KeyCorp (KEY), a Cleveland-based regional bank, said it swung to Q4 loss of 28 cents, excluding 85 cents tied to a goodwill charge. That's down from a 6-cent gain last year and 26 cents worse than expected. Net interest income fell 10% to $639 mil. Net charge-offs nearly tripled to $342 mil. It rose 5.2% to 7.04. • Comerica (CMA), a Texas-based bank holding company, said Q4 EPS fell 75% to 19 cents ex items, a nickel below views. Comerica set aside $192 mil for credit losses. Net charge-offs grew to $133 mil. It will cut 5% of its work force, or 509 jobs, and freeze some salaries. Shares surged 9.3% to 15.15. The regional bank tumbled 29% to 2.85 after it swung to a Q4 loss of $2.06 a share ex items, much worse than forecasts for a 1-cent profit. Fifth Third Bancorp (FITB) said its loss was $3.82 a share including items, or $2.2 bil. The bank was hurt by rising defaults on loans, goodwill charges and credit costs. It took an impairment charge of $965 mil due to its declining stock price. It also nearly tripled its reserve for loan and lease losses to $2.8 bil. "We're certainly in the midst of a once-in-a-lifetime set of economic conditions," Microsoft Chief Executive Steve Ballmer said on a conference call with analysts. "The economy is resetting to a lower level of business and consumer spending that's based largely on the reduced leverage in the economy." 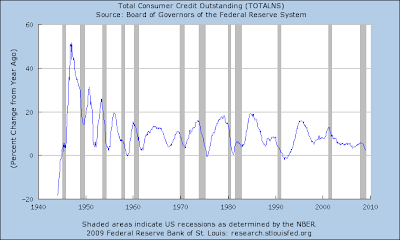 And add one last piece of information: according to the Federal Reserve consumer credit has dropped the last two months. For the last few decades, household incomes have not kept pace with the consumer's desire to spend. As a result, the consumer has taken on larger and larger amounts of debt. 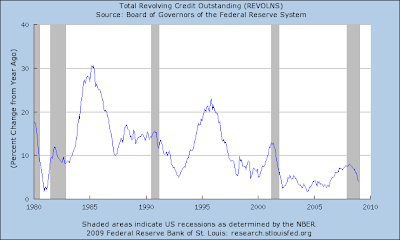 Now we are probably starting the great unwinding; that is, consumers getting rid of all their debt (or at least paying some down). While this is good in the long run because it will create a healthier consumer it is bad for the economy because the US economy derives 70% of its growth from consumer spending. And that's what Ballmer is getting to. -- Prices rallied from a low of 71 at the end of last summer to 87 near the end of last year. Prices have fallen from the level and subsequently rallied again but have not gotten back to the 87 level. In other words, the rally petered out. -- The upward sloping trend line has now below resistance: notice how prices edged up against the line, but didn't cross it until recently. And then the post crossing candle pattern is a shooting star -- a weak formation. 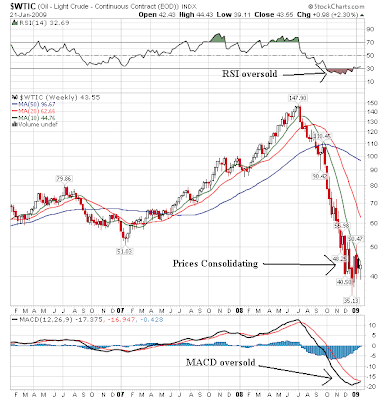 Bottom line: the weekly chart says prices have peaked. However, the daily chart says prices can move higher. I would split the difference by saying prices have some upside to the previous peak. Home prices in the U.S. dropped the most in at least 18 years and builders broke ground on the fewest houses since record-keeping began as the recession deepened, government reports said today. Prices in November declined 8.7 percent from a year earlier, the biggest drop in records going back to 1991, the Federal Housing Finance Agency said today in Washington. Housing starts fell 16 percent last month to an annual rate of 550,000, the lowest since the government started compiling statistics in 1959, the Commerce Department said. “We are witnessing a severe recession, historic declines in housing prices, growing job loss and a concern that these negative trends are accelerating,” Timothy Geithner, President Barack Obama’s nominee for Treasury secretary, said in written responses to questions posted on the Senate Finance Committee Web site today. 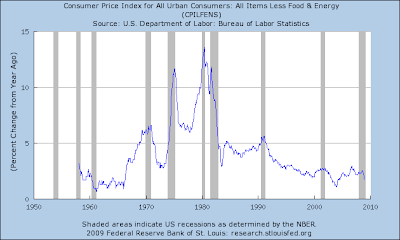 Prices do not drop at record rates at the bottom; they drop that fast on the way to the bottom. South Korea's economy shrank a more-than-forceast 5.6% in the fourth quarter, its worst performance in a decade, showing how hard the global downturn is hammering Asia's exporters. "It's far worse than expected," said Standard Chartered economist Chun Chong-woo. "Today's data will spur the central bank to move to cut (interest) rates further to 1.5% by the end of the first half." The seasonally adjusted gross domestic product figure for the October-December period compares to 0.5% growth in the third quarter, according to preliminary data issued by the Bank of Korea on Thursday. Singapore, a bellwether for Asia's export industry, sharply reduced its economic outlook for 2009, prompting concerns that the region's slowdown is intensifying and putting additional scrutiny on a slew of economic figures expected in coming days. The city-state said Wednesday it expects its economy to shrink by 2% to 5% this year. The forecast marks a downward revision from just three weeks ago, when officials at Singapore's Ministry of Trade and Industry predicted a worst-case decline of 2% and possible growth of 1%. The ministry blamed increasingly pessimistic signals of weakening global demand for key products such as electronics and chemicals. Intel Corp. said it will close several older factories, displacing 5,000 to 6,000 workers, as the company reacts to a sharp drop in demand for its computer chips. The Silicon Valley giant had previously expressed optimism that prior job cuts would be sufficient to cope with the recession's impact on its business. But with a 90% drop in fourth-quarter earnings and a downbeat outlook from computer makers, pressures increased to cut costs further and improve the sagging utilization of its factories. Intel said not all the affected employees, about 6% to 7% of its work force of 84,000, will lose their jobs. Some may be offered positions at other factories, the company said. The cuts come on the heels of similar moves across the technology industry. Advanced Micro Devices Inc. last week said it was cutting 1,100 jobs and imposing temporary pay cuts in response to the economic slowdown. Last week, Intel Chief Executive Paul Otellini told employees in an internal Webcast that profitability in the first quarter was too close to call. Intel hasn't reported a net loss since 1986. An account of Mr. Otellini's remarks was reported by Bloomberg. International Business Machines Corp. employees have informed Alliance@IBM, an affiliate of the Communication Workers of America, that workers at a number of locations have been told their jobs are being eliminated. Lee Conrad, national coordinator for Alliance, said that he has received a number of reports of people being informed that they are subject to what IBM calls a "resource action." He said that the reports are coming from people who work for the software group in applications development and marketing, among other functions. -- Prices broke through the downward sloping trend line, but haven't been able to maintain the upward momentum. Gas prices have been dropping like a stone, although they have rebounded over the last few weeks. One heck of a rally today. Once prices got near yesterday's lows the rally started. After lunch the whole market went long aggressively bidding the market higher. Note that prices moved higher until the close and ended with strong volume. Also note prices regained a fair amount of ground lost yesterday. Notice that prices have crossed over a downward sloping trend line that started over a week ago. 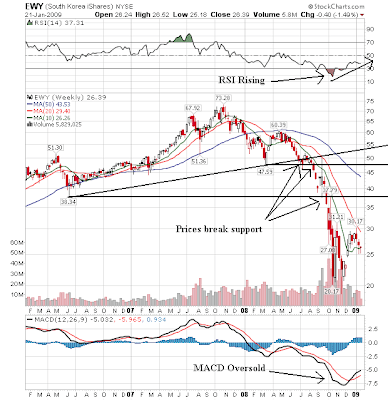 But on the daily chart, we're still in bearish mode -- prices are below all the SMAs, all the SMAs are moving lower and the shorter SMAs are moving lower. So -- How Good Was the Bush Economy? General Motors sold fewer cars globally than Toyota last year, as the Japanese automaker passed the Detroit company for the first time. GM says it sold 8.356 million cars and trucks in 2008, falling about 616,000 vehicles short of Toyota's total of 8.972 million. General Motors Corp. posted an 11 percent drop for the year, while Toyota's sales fell 4 percent. Financial shares crashed to new lows after top asset management firm State Street and a regional bank reported huge losses, putting pressure on President Obama to come up with quick solutions to a rising tide of red ink. State Street (STT) said it may need to raise capital following huge unrealized losses in its commercial paper program and investment portfolio. Meanwhile, Regions Financial (RF), a big Southern bank, lost $6.22 billion in the fourth quarter on massive write-downs. The bad news sent the SPDR Financial ETF tumbling 16.5%, its fourth straight drop and a record low. It's down 35% in 2009 alone. 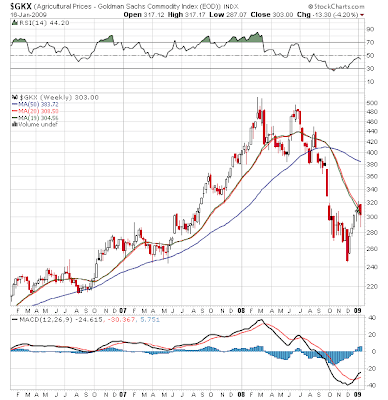 Bank of America (BAC) lost 29% and Citigroup (C) 20% after both reported big losses last week. JPMorgan Chase (JPM) dived 21% and Wells Fargo (WFC) 24%. All the banks cited above hit long-time lows. As we enter earnings season expect more of this to happen. The bottom line is there is still a ton of bad debt out there which is deteriorating in quality. As that happens, banks will continue to take hits. 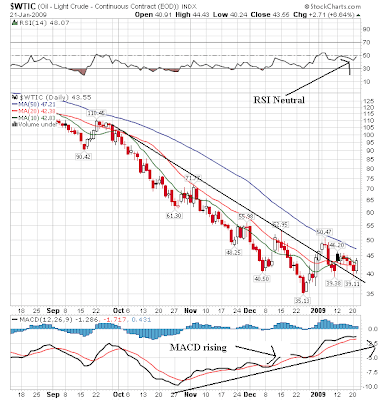 -- The RSI indicates prices are weak and have been for a long time. 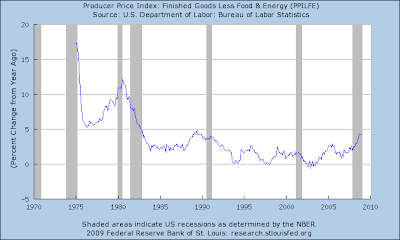 At the end of 2003, prices broke out in a big way, increasing from 1.00 to 1.50 by the end of 2004. By the end of 2005 prices more than doubled, closing near over 2.000. 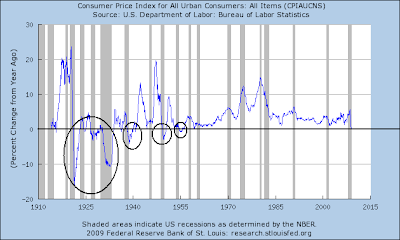 In 2006 prices really took off, but then they consolidated in a triangle pattern until mid-2008. Then prices dropped like a stone -- moving lower by 50% plus in roughly 6 months time. On the weekly chart, notice the prices had some really big gaps down starting at the end of the second quarter. Also note the prices moved through key technical support levels as well. This chart shows a massive move out of the copper market over the last 6-9 months. My guess is some of this is speculators getting out. However, I also think there is a great deal of bearishness out there regarding the economy which makes copper unattractive. "Manufacturing activity continued to decline at a rapid rate during the month of December. The decline covers the full breadth of manufacturing industries, as none of the industries in the sector report growth at this time. New orders have contracted for 13 consecutive months, and are at the lowest level on record going back to January 1948. Order backlogs have fallen to the lowest level since ISM began tracking the Backlog of Orders Index in January 1993. Manufacturers are reducing inventories and shutting down capacity to offset the slower rate of activity." In December, none of the manufacturing industries reported growth. The industries reporting contraction in December — listed in order — are: Nonmetallic Mineral Products; Wood Products; Fabricated Metal Products; Printing & Related Support Activities; Textile Mills; Plastics & Rubber Products; Paper Products; Transportation Equipment; Machinery; Primary Metals; Electrical Equipment, Appliances & Components; Chemical Products; Computer & Electronic Products; Miscellaneous Manufacturing; Food, Beverage & Tobacco Products; and Furniture & Related Products. Two industries reported no change in activity compared to last month: Apparel, Leather & Allied Products; and Petroleum & Coal Products. Simply put, this is not an environment where copper is widely used. Prices dropped below key levels today -- levels established last Thursday. Also note the extremely important downward bar today; prices took a major move lower. Forcing banks to lend couldn't be a more intellectually bankrupt idea. The business of commercial banks is to lend money when the risk-adjusted returns exceed its cost of capital. Just lend money, because we said so? We've seen this movie before - it's called Fannie Mae and Freddie Mac - and it doesn't end well. The right way to approach the problem is to create truly healthy banks, either out of currently sick institutions or de novo, and to let them make rational lending decisions. If the Government sees a particular constituency that requires funding, don't force a bank to do it if it doesn't make economic sense. 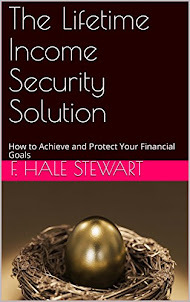 Either create a discrete program or use tax incentives to generate the necessary resources. The worst possible outcome of TARP is to create another generation of sick institutions by forcing them to make irrational loans to satisfy the moral (or public relations) objectives of our Government representatives. Obama needs to fight this urge with a vengance. While I respectfully disagree with his statement about Fannie and Freddie, I agree wholeheartedly with everything else stated. You can't force banks to lend. Doing so will only lead to a host of other new problems. 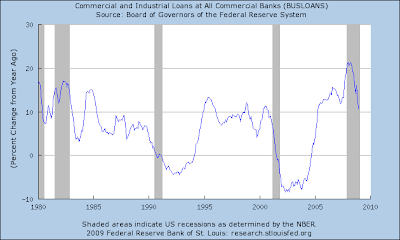 Below are charts from the St. Louis Federal Reserve of various components of lending. All charts show a year over year percentage change. Please click on all images for a bigger image. 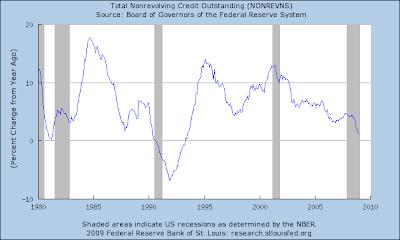 Above is a chart for total credit outstanding. While the number is still positive it has taken a bit hit over the last year or so. 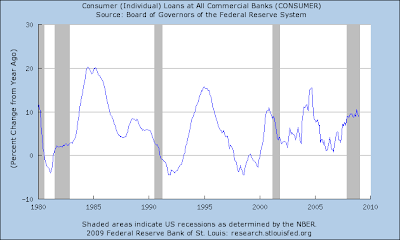 However, total consumer loans have leveled off. What does this tell us? While the rate of change is still positive for all areas, the rate of change is decreasing. In some cases, the rate of change is very large and sudden. This is consistent with the anecdotal information from the Beige Book at the Senior Loan Survey mentioned below. The previous version of the U.K. rescue plan has failed to stem economic erosion or to revive lending. How much worse it will get for banks remains largely unknown. That was made plain on Monday when RBS said it expects to report a 2008 loss of £22 billion to £28 billion ($31.8 billion to $40.5 billion). Under the latest rescue provisions, the government's share of RBS will increase to 70% from 58%. RBS shares fell 67% on Monday. Troubled assets continued to mount at insured commercial banks and savings institutions in the third quarter of 2008, placing a growing burden on industry earnings. Expenses for credit losses topped $50 billion for a second consecutive quarter, absorbing one-third of the industry's net operating revenue (net interest income plus total noninterest income). Third quarter net income totaled $1.7 billion, a decline of $27.0 billion (94.0 percent) from the third quarter of 2007. The industry's quarterly return on assets (ROA) fell to 0.05 percent, compared to 0.92 percent a year earlier. This is the second-lowest quarterly ROA reported by the industry in the past 18 years. Evidence of a deteriorating operating environment was widespread. A majority of institutions (58.4 percent) reported year-over-year declines in quarterly net income, and an even larger proportion (64.0 percent) had lower quarterly ROAs. The erosion in profitability has thus far been greater for larger institutions. The median ROA at institutions with assets greater than $1 billion has fallen from 1.03 percent to 0.56 percent since the third quarter of 2007, while at community banks (institutions with assets less than $1 billion) the median ROA has declined from 0.97 percent to 0.72 percent. Almost one in every four institutions (24.1 percent) reported a net loss for the quarter, the highest percentage in any quarter since the fourth quarter of 1990, and the highest percentage in a third quarter in the 24 years that all insured institutions have reported quarterly earnings. 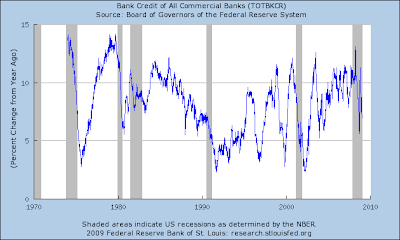 In Every Beige book issued in 2008 has indicated credit conditions were tightening and loan demand was decreasing. Reports from banks and other financial institutions noted further declines in residential real estate lending, and lending to the commercial real estate sector was generally described as mixed. Some Districts reported lower consumer loan volumes, whereas the volume of commercial and industrial lending varied. Most Districts cited tighter credit standards. Most Districts reporting on banking cite tight or tightening credit standards and stable or weaker loan demand. Lending activity also varied across Districts and market segments, though tighter credit standards were reported for most loan categories. 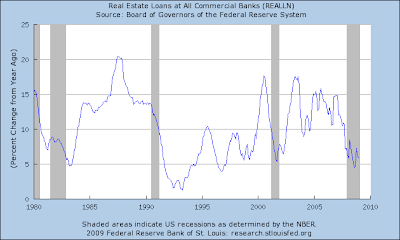 In banking, loan growth was generally reported to be restrained, with residential real estate lending and consumer lending showing more weakness than commercial lending. Most Districts reported easing loan demand, especially for residential mortgages and consumer loans; lending to businesses was mixed. Lending contracted, with many Districts reporting reductions in residential, commercial and industrial lending and tightening lending standards. In the January survey, domestic and foreign institutions reported having tightened their lending standards and terms for a broad range of loan types over the past three months. Demand for bank loans reportedly had weakened, on net, for both businesses and households over the same period. Compared with the January survey, the net fractions of banks that tightened lending standards increased significantly for consumer and commercial and industrial (C&I) loans. Demand for bank loans from both businesses and households reportedly weakened further, on net, over the past three months, although by less than had been the case over the previous survey period. In the current survey, large net fractions of domestic institutions reported having tightened their lending standards and terms on all major loan categories over the previous three months. In particular, the net fractions of banks that had tightened credit standards on consumer loans increased notably relative to the April survey. In the current survey, large net fractions of domestic institutions reported having continued to tighten their lending standards and terms on all major loan categories over the previous three months. The net percentages of respondents that reported tightening standards increased relative to the July survey for both C&I and commercial real estate loans, as did the fractions reporting tightening for all price and nonprice terms on C&I loans. The new team will manage the TARP “in a much different way,” David Axelrod, Obama's chief political adviser, said Jan. 18 on ABC's “This Week” program. Another aide went further, criticizing the results of TARP under Paulson. “Anyone who looks at it has got to be disappointed when they look at what's happened to lending, have got to think the results have been unsatisfactory,” Lawrence Summers, director-designate of the National Economic Council, said on CBS's “Face the Nation” program Jan. 18. Simply put, we are not in a credit expansion friendly environment. That is not the point of what is happening. The government is attempting to prevent a broad-based financial meltdown. That's the metric for judging the current action. They are making things up as they go along in this process -- that is incredibly obvious. But it's also important to remember, the last time we were here was 1929. It's been awhile. And while there has been a lot of debate about how to prevent a wide scale financial meltdown, there has been little practice at it. -- The SMAs are sending a mixed signal; the 10 is below the 20, but the 20 has just turned lower. 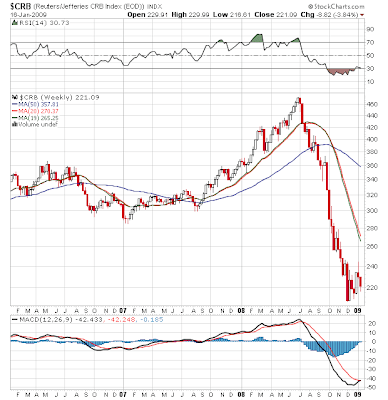 Deflation ... Or The Effect of a Commodity Bear Market? A deflationary spiral is a situation where decreases in price lead to lower production, which in turn leads to lower wages and demand, which leads to further decreases in price. Since reductions in general price level are called deflation, a deflationary spiral is when reductions in price lead to a vicious circle, where a problem exacerbates its own cause. The Great Depression was regarded as a deflationary spiral. However, I'm not sure this is an issue. 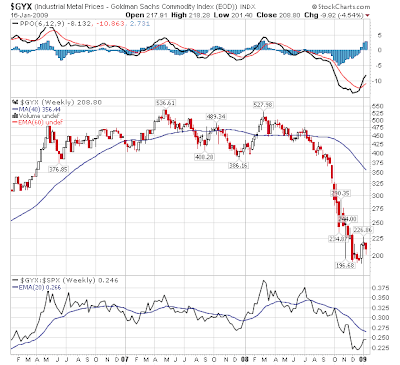 From a look at the following charts, it looks as though we're feeling the effect of a commodity price bubble popping. While industrial metals probably weren't in a bubble, prices have collapsed over the last six months. Given the major drop in industrial production this is to be expected. There is a higher possibility agricultural prices were in a price bubble of sorts. 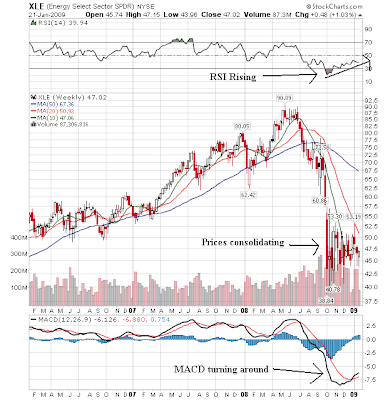 They formed a double top in 2008 and have since fallen approximately 50% since their second top at the end of the second quarter 2008. 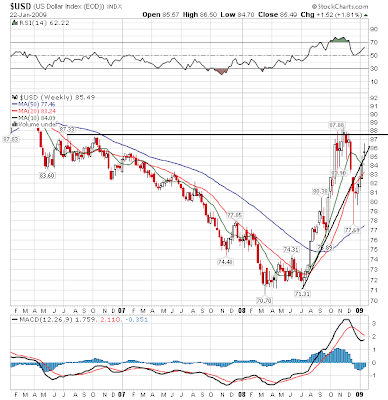 The CRB index is heavily influenced by oil, which hit the 140+ level at the end of last summer. Now this index has also dropped about 50%. So, two groups of commodities (agriculture and energy) were at really high prices. Some would argue these commodities were in a price bubble. I'm not sure if that was true or not -- there were strong reasons for a fundamental bull market. However, the rapid descent of the respective prices does give strong ammunition to the people who argue there was a bubble. That being said... consider these charts. Above is a chart of the year over year change in CPI for all goods. Notice we are approaching the 0% level. That is something we haven't done for over 50 years. This is one of the primary problems of the Great Depression -- a deflationary spiral. Now prices are moving into that direction which has everybody understandably concerned. 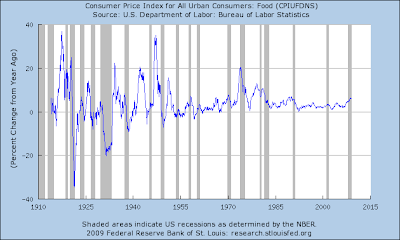 But note that food prices are still increasing year over year. 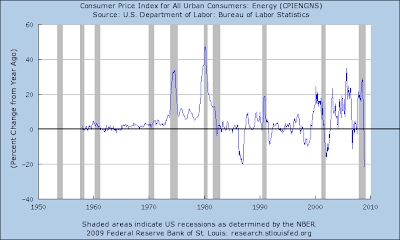 In other words, from a CPI perspective, the drop in energy prices is a big reason for the big overall year over year drop. 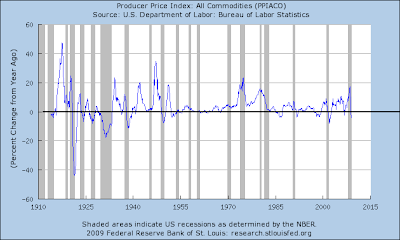 Producer prices for all commodities are dropping like a stone. In other words, assuming the commodity prices were in a trading bubble, does that mean this isn't really deflation but instead a commodity based correction? In addition to layoffs, companies are increasingly trimming wages, a tactic economic historians said hasn't been wielded broadly since the Great Depression. Heavy equipment maker Caterpillar Inc. announced in late December it would cut executive pay by half, and many salaried employees would see cuts of as much as 15%. Hutchinson Technology, a Hutchinson, Minn., maker of disk drive components, cut salaries 5% for employees who remained after a round of layoffs concluded this week. In Galveston, Texas, police and firefighters unions agreed to a 3% pay cut as the city grapples with the recession and the aftermath of Hurricane Ike. Saks Inc. plans to eliminate 1,100 jobs, or 9% of its work force, and slash its capital expenditures. In addition, the luxury retailer will eliminate 2009 merit-based wage increases. Saks will also suspend matching contributions for 401(k) retirement accounts for at least a year and suspend benefit accruals for the few remaining employees in its pension plan. (Boston) Most contacted firms anticipate cutting employment and capital spending in 2009. Those reporting on intended pay increases for 2009 say they will be below those in recent years. Companies typically are planning raises that are 0.5 percentage point to 1.5 percentage points lower than in 2008, but some are enacting partial or across-the-board pay freezes. (Chicago) Wage pressures were limited. However, several contacts noted that firms were choosing to freeze or cut pay instead of laying off workers to lower labor costs. In addition, contacts also reported that firms were reducing or eliminating elements of non-wage compensation. (San Francisco) Contacts reported little or no upward pressure on wages. With unemployment rising in most areas, companies have seen an increase in the quantity and quality of applicants for open positions, which limits upward wage pressures. Some contacts also reported that they are implementing or considering wage freezes, which employees appear increasingly willing to accept. Wage gains continued to slow for worker groups that previously had seen rapid growth, notably those skilled in the use of advanced technologies. This is an interesting development. One of my pet theories (totally undocumented) is that over the last 30+ years we've seen companies pull back on hiring until literally the last possible moment when they need employees. That means that each new employee is that much more important to the company. That makes firing workers more difficult because they are that much more important to the overall scheme of the company. 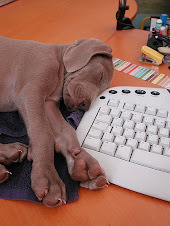 Again, this is a pet theory based on nothing more than intuition. However, it would explain why some companies are asking employees to take wage cuts and salary freezes. Note this chart uses EMAs. 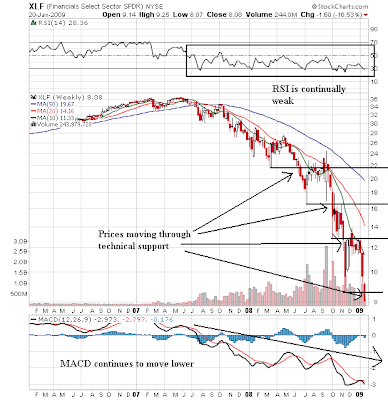 These moving averages place more emphasis on the more recent prices. 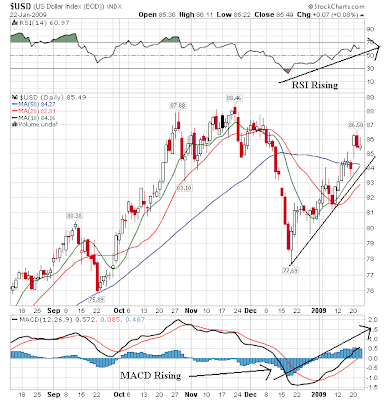 -- Note the MACD is giving a sell signal. -- The daily 5 minute chart is showing a possible reversal. Prices crossed over the 200 minute SMA, fell back and then moved higher again. Also note that on Friday volume increased as prices moved higher -- a healthy sign. 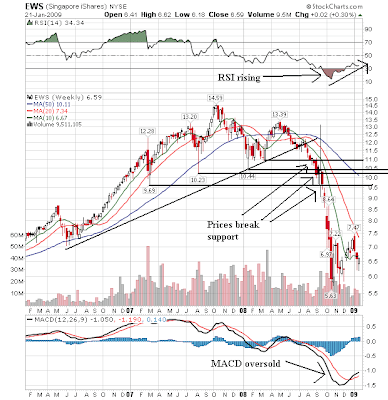 The issue that is really concerning me right now is the MACD's position. 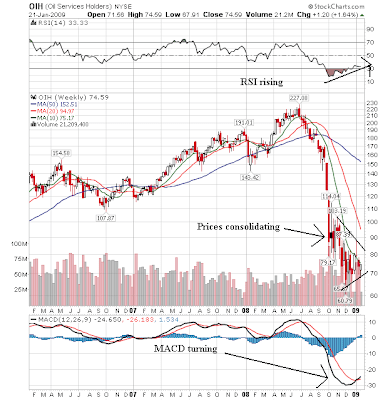 It is possible for the MACD to remain at high levels and essentially bounce at those levels for some time. But also remember we're at the beginning of earnings season which franklyh looks terrible right now.